Moving abroad doesn't mean that you need to lose your rights as a UK citizen. For many people, the idea of no longer being able to take part in UK elections is quite stressful as they enjoy being part of the political process and shaping the future of the country. What most people don't realise however is that you can actually continue to vote in the UK even when you leave. There are a number of specific rules for this, just as there are a number regarding voting in the new country you call home. If you move abroad permanently you do not lose the right to vote for 15 years. You are still able to vote in general elections, but aren't permitted to vote in UK local government elections. If you were previously registered to vote in the UK before your move abroad, this carries forward with you and you can continue voting in the UK for another 15 years. In order to vote from overseas, you simply need to download a registration form and send it to the electoral registration office where you last voted. If you're unable to do this, you can contact the electoral registration office and ask them to send you out a form to your new address. The form must be signed by a witness to state that they know you and that it was you who made the vote. You must ensure the witness is a British citizen living overseas, but not a relative. If you are struggling to obtain someone's signature, ask at your local embassy or British consulate. If you are registered to postal vote from abroad, you need to be able to return your form within a week. If you think this is going to be an issue, you can arrange for someone in the UK to proxy vote for you. This means that someone you know well and trust implicitly can vote on your behalf at any polling station or by post. If you're returning to live in the UK after a lengthy period abroad, you must register again for voting. To register at your new address, simply fill in a registration form and return it to your local electoral registration office. If you're a permanent resident of another country, you may find that you feel it would be more beneficial for you to be able to vote in local and national elections there. As your new life is now elsewhere, it makes sense that you would want the right to vote in your new home and to influence the government which rules you. There are a number of different policies in existence dependent on which country you're living in and you should always seek specific advice from the local authority in your new home. Voting in the USA – Voting in US elections depends on your immigration status. If you are considered a naturalised US citizen then you will have the same voting rights as a citizen who was born there. If you are a permanent resident you generally may not vote in elections that are limited to US citizens such as the national presidential election. It's likely that you are able to vote in the local and state elections as some of these don't require citizenship. Voting in Australia – If you're a temporary or permanent resident in Australia, you don't have the right to vote in any elections, whether those are national or local. If you become an Australian citizen, you then have the same rights as any other Australian and are able to vote in all elections. In Australia it is illegal not to vote if you have the right to and you can be fined. Voting in Canada – Canada have a similar system to their neighbours when it comes to voting. You must be a citizen of Canada to vote in general elections and may be able to vote in some local elections as a permanent resident. 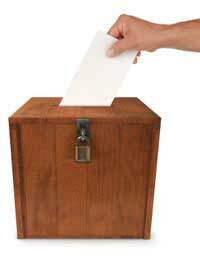 Ensure that you speak to a local authority as it isn't unheard of that people get fined for voting illegally. In general, for most countries, the right to vote comes from being a citizen. If it's important to you that you have a say in local policy and government, you should find out whether you're eligible to apply for citizenship.